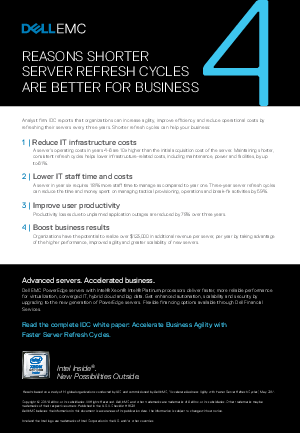 Shorter server refresh cycles translate to better business outcomes—period. Refreshing servers every 3 years instead of every 4-6 can avoid a 10x increase in operating costs. And that’s just the start. Download “4 Reasons Shorter Refresh Cycles are Better for Business” from Dell EMC to learn how using best-in-class servers, powered by Intel® Xeon® Platinum processors—and regularly refreshing them—improves business agility and increases efficiency.